In addition to conditionally compiling code based on the DEBUG symbol, you can define your own new symbols and then use the #if directive to indicate that a block of code should only be compiled when that symbol is defined. For example, let’s assume that you want to easily be able to include/exclude code that does some logging, but you don’t want to necessarily do this in only the Debug configuration. Right-click on the project and select Properties. 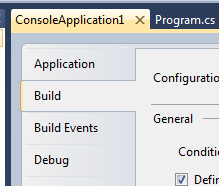 In the project properties window, click on the Build tab. Finally, use the #if directive to identify code that should only be built when the LOGGING symbol is present.